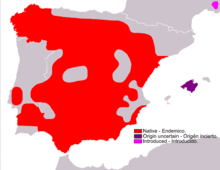 Three subspecies of the Granada hare are known, which vary in colour and size. 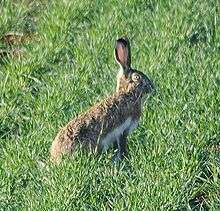 Lepus granatensis granatensis - This, the most abundant subspecies, is found in Andalusia, Extremadura, Meseta Central, Valencia and the south of Aragon and Catalonia. Lepus granatensis gallaecius - This subspecies with a darker coat occurs in the northwest of the Iberian Peninsula, in Galicia. Majorcan hare, Lepus granatensis solisi - This subspecies is probably extinct nowadays or at least very rare. There have been no trustworthy sightings in recent years. This subspecies has a lighter coat and is smaller. ↑ Hoffman, R.S. ; Smith, A.T. (2005). "Order Lagomorpha". In Wilson, D.E. ; Reeder, D.M. Mammal Species of the World: A Taxonomic and Geographic Reference (3rd ed.). Johns Hopkins University Press. pp. 199–200. ISBN 978-0-8018-8221-0. OCLC 62265494.